More and more drivers are spending extended amounts of time behind the wheels of their vehicles for a variety of reasons. Many of these drivers are forced to drive when tired or fatigued, and as such, it can be easy for such operators to lose focus or even fall asleep behind their steering wheels. Such situations can obviously lead to serious accidents, but the good news is that the experts at the Ford Motor Company have come up with an effective antidote to this syndrome. This antidote is known as the Ford Co-Pilot360 system, and this specialized service combines many driver awareness tools to enable today's drivers to operate their vehicles with greater levels of safety than ever before. One feature of this system is the Lane Keeping Assist service. The Ford Co-Pilot360 Lane Keeping system has at least three tiers of functionality. The first tier of functionality can give drivers various warnings if and when their vehicles begin to drift out of place. If drivers fail to respond to the first warning, the system moves to its second level of functionality which consists of manually steering vehicles back into place. Yet another level of service keeps an eye on driver behavioral patterns and provides either audio or visual alarms if driver attention is deemed to be less than acceptable. 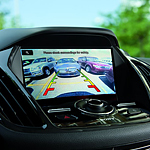 These Ford Co-Pilot360 systems have the potential to prevent accidents and to even save lives.